After numerous requests for our recipes, we created our own cookbook 17 years ago. 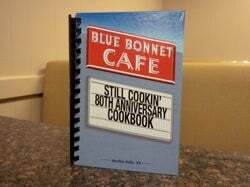 It was a collection of recipes prepared daily at Blue Bonnet Cafe, as well as tried and true favorites of employees, friends and family. Once we sold 25,000 copies, we thought it was a good idea to add some new recipes in celebration of our 80th anniversary. In this cookbook, you'll find 160 new recipes in addition to all of the original recipes. We hope you enjoy them as much as we do. The cookbook includes all of our pie recipes, many of our soup recipes, our chicken-fried steak recipe, and the pot roast recipe. It's perfect gift for the cook in the family.